Rare Scottish tartans. THE LORD OF THE ISLES. 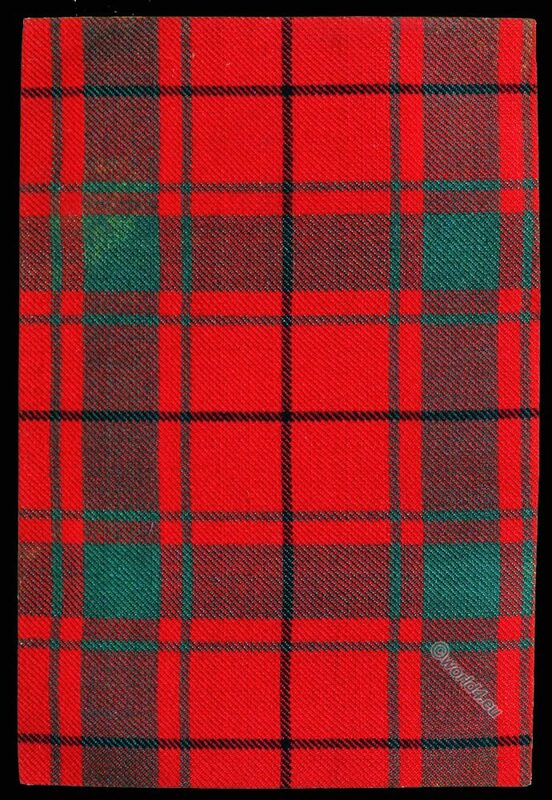 Home » Rare Scottish tartans. THE LORD OF THE ISLES. THE LORD OF THE ISLES. THE authority for the accompanying example is a portrait of Sir Alexander (afterwards first Lord) Macdonald of the Isles, in the collection of Lord Macdonald of the Isles, at Armadale Castle in Skye. Of that painting, executed by an unknown artist about 1750. The vignette on the title page of the present work is a reproduction. The tartan is represented only in the coat of the youth holding the golf-club, the trews being in red and white check; and a close inspection reveals an important addition to what has long been accepted as the Lord of the Isles pattern-to wit, that of the black lines intersecting the red squares. The omission of these black lines from the modern sett is obviously accidental, for the tartan as now worn is based on the authority of the picture, which was believed to have been accurately copied. The origin of the error cannot be ascertained; but probably, a mistake in the reproduction of the design when tartans became the wear after the repeal of the prohibitory statute has remained undetected till now. On the canvas, at least, the intersections are clearly depicted; and, moreover, the tartan thus conforms to the rule of breaking large squares generally observed in old clan patterns. The Costume of the Clans, by John Sobieski Stuart and Charles Edward Stuart, contains a presentment of the painting which, though professedly colored from the original, is nevertheless extremely inaccurate. It may be added that the tartan, which is that usually worn by H. R. H. the Prince of Wales, who bears the title of the Lord of the Isles, has never hitherto been faithfully delineated in any previous work nor properly reproduced in any textile fabric of modern manufacture. THE LORD OF THE ISLES: HUNTING. Like the preceding example, the present is based on a painting in Armadale Castle-a life-size representation of the first Lord Macdonald of the Isles, dating from about 1765. On the evidence of style the work is ascribed to Allan Ramsay the younger, who about this period painted many portraits in tartan costumes, in which, fortunately for our purpose; he displays as a rule the patterns boldly and brilliantly. Through the kindness of Lord and Lady Macdonald of the Isles the Editor had last year an excellent opportunity of obtaining reproductions of the tartans delineated in their family portraits. The painting in this case was photographed to a large scale, and afterwards colored from the original by an experienced artist (a similar plan being adopted in the case of Plate I.) From these the silks were woven, carefully compared with the paintings, and so absolute accuracy of reproduction secured. 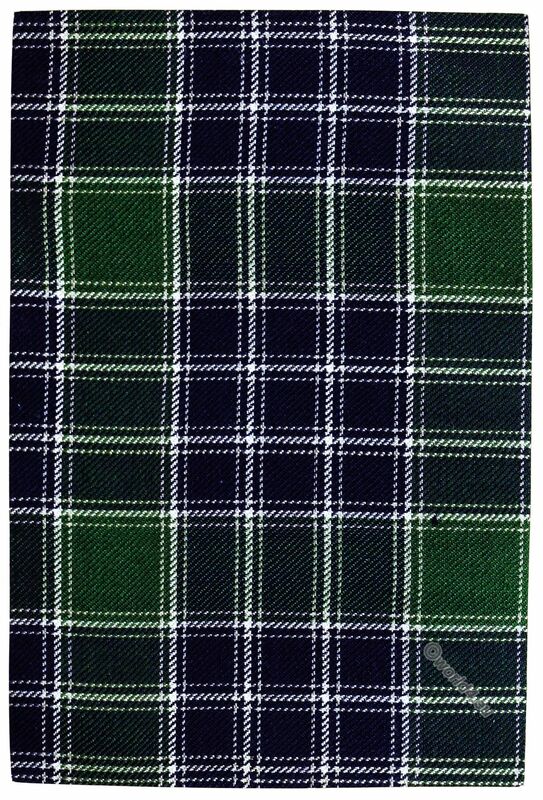 Traditionally known as the Lord of the Isles hunting tartan, the pattern here given appears in the coat, vest, and kilt of the figure portrayed. The statute against the wearing of the Highland dress, including tartans, passed in 1747, was operative when the picture was painted. It may be, however, that as the Macdonalds of Sleat were adherents of the Government, in name at least, special indulgence was extended to them. During the greater part of the present century the design was not rendered in textile fabric, but recently Lord Macdonald of the Isles had it woven for his use. With characteristic inaccuracy of coloring, The Costume of the Clans represents the tartan with a predominance of red, though the original contains no trace of that color. Source: Old and rare Scottish tartans, with historical introduction and descriptive notices by Donald William Stewart, 1893. This entry was posted in 1893, 19th Century, Scotland and tagged Tartan, The Clans of the Scottish Highlands, Traditional Scottish National Costume on 7/5/18 by world4.